How do you feel about cilantro? Because if you’re a cilantro hater, you may want to avert your eyes. (Or maybe run in terror?) 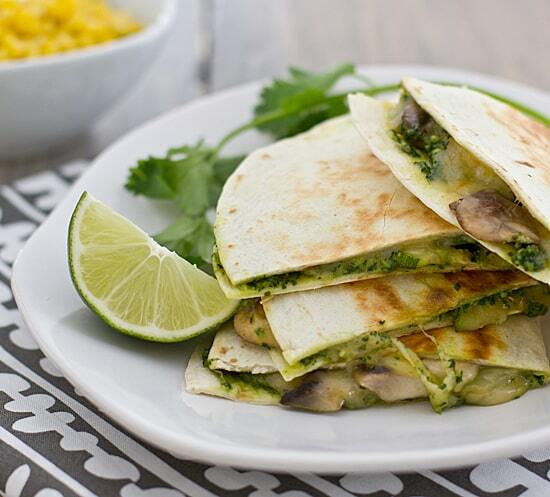 These Mushroom & Zucchini Quesadillas have a generous helping of cilantro pesto on them. So you’ve been warned, okay? Personally, I love cilantro. I never really got all passionate hatred directed towards this inoffensive little herb. I mean, I’m sure there are people who hate basil or oregano. But they don’t make a thing out of it. And cilantro hating is most definitely a thing. There’s even an I Hate Cilantro website. Well, apparently it’s a matter of genetics. Cilantro haters taste soap when they eat cilantro. It’s a genetic predisposition, something they’re born with. There are other explanations too, though–some of the molecules that form the aroma of cilantro are also molecules found in both lye (soap!) and insects. Interestingly, crushing cilantro leaves converts these molecules into other substances which makes them inoffensive to cilantro haters. So cilantro pesto? Should be totally cool with both cilantro haters and cilantro lovers alike. Of course, if you hate cilantro with a passion, it might be too much to ask to even put you in the same room with fresh cilantro, let alone make it into a pesto. But this cilantro pesto is worth taking a chance on. Its bright, fresh (and spicy!) flavor takes an ordinary veggie quesadilla recipe and makes it something worth blogging about. In fact, I’m so in love with this pesto that it might be making some more appearances on Oh My Veggies very soon! Cilantro pesto adds a fresh, spicy flavor to these easy veggie quesadillas. Heat oil in a medium skillet at medium-high heat. Add zucchini and mushrooms and cook, stirring often, 5-6 minutes or until softened but not mushy. Add salt and pepper to taste. Spread half of each tortilla with pesto. 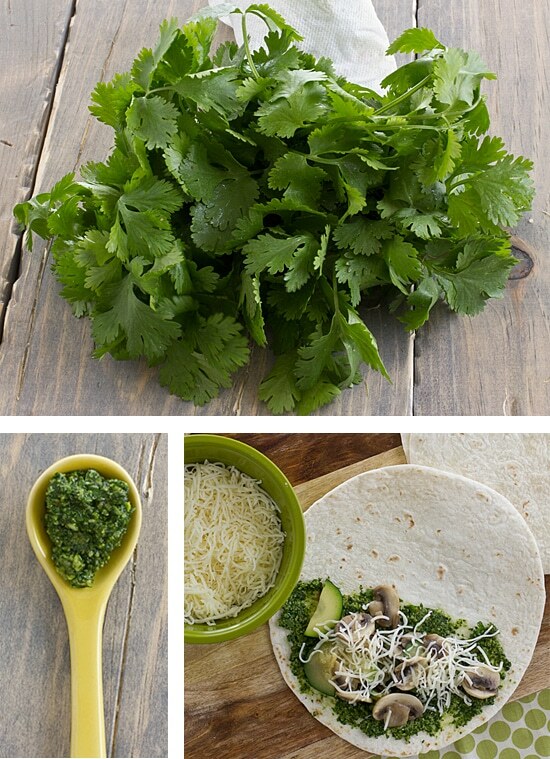 Divide vegetables and cheese onto pesto-side of tortillas and fold in half. Wipe out skillet. Heat on medium and cook quesadillas, two at a time, about 2-3 minutes on each side or until golden brown and slightly crispy. (If you prefer, you can use a grill instead.) Cut each quesadilla in half and serve with salsa, sour cream, and lime wedges. That definitely does not sound pleasant! I’ll never understand mushroom haters either – it seems like people who hate cilantro and people who hate mushrooms are the most passionate about their hatred, although since I started blogging, I’ve discovered that there are also lots of people who really, really hate bananas. These were delicious!! Even my picky husband and toddler loved these!! I didn’t tell my husband what was in them of course. 😉 I just sat it in front of him and he was so excited to see a quesadilla. Then he devoured it and asked for another one! Win! Woo hoo! 😀 I’m so happy to hear they were a hit! Delicious!! Making the pesto is so worth it, it brings the whole thing to a different level. Thank you! I made a few changes to the cilantro pesto (I do PeaPod deliveries here because it’s suuuuper hard to get to the store — they were out of cilantro so I just made due with what I had on hand, and my garlic went bad overnight 🙁 weep weep) — I added one serrano pepper (because I love love love heat) and used mint + basil leaves and used garlic salt instead of adding salt separately and the garlic clove and hoooly macaroni was it delicious! I used a spicy Monterrey jack cheese (surprise) but aside from that followed these instructions pretty well.